I want you to do something that you’ve probably never done before. I want you to hope that people complain about your company on your social media sites. Sounds like I’m crazy, I know, but you really want them to do it. I’m not perfect. You’re not perfect. 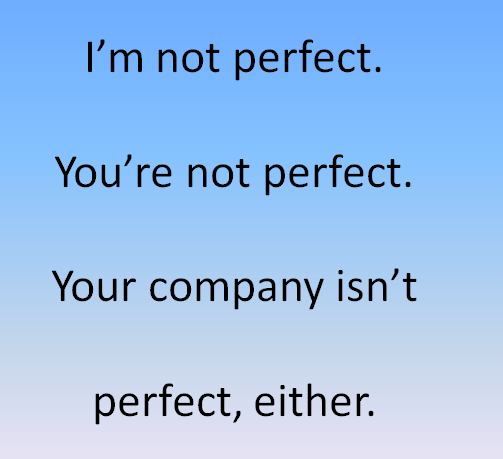 Your company isn’t perfect, either. So, if they’re going to complain, at least it should be someplace where you can help direct the discussion and affect its outcome. 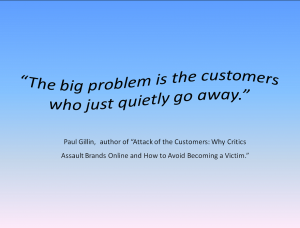 Paul Gillin, author of “Attack of the Customers: Why Critics Assault Brands Online and How to Avoid Becoming a Victim,” explained it best in an article for Advertising Age. In the article, he talks about how many complaints are found on the UPS Facebook page and how a customer service rep helped people through their problems. 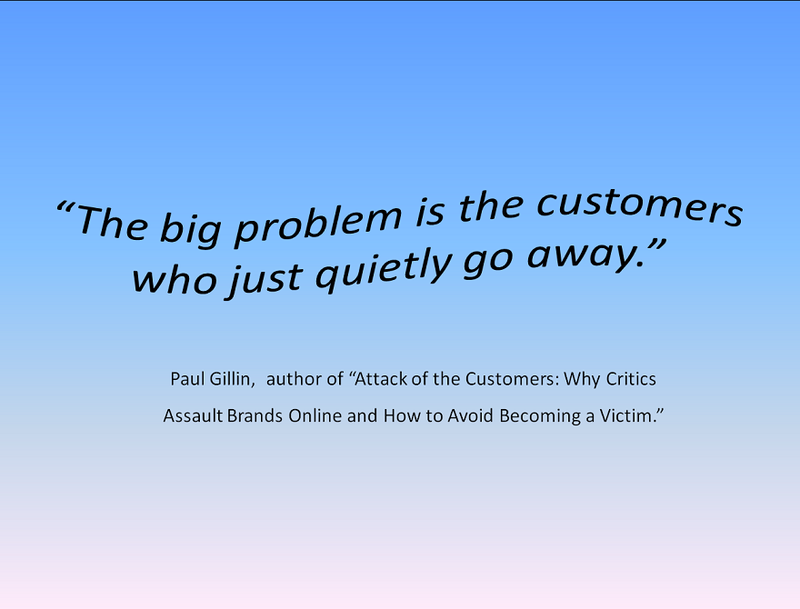 Customers often go to social media sites to complain in hopes of getting a solution to their problem. In some cases, it may be after trying to resolve it in a store or on the phone. In other cases, people go to social media first, in hopes that the added exposure will embarrass or force the company into action that they would not have done otherwise. I admit that I’ve done this myself – usually if I’ve had a bad experience with the company previously through more traditional channels. Express your concern and if you can help them quickly and easily, do so right then and there. It’s possible that one of your existing customers will step up even before you do and help the person with their issue. That’s a real Ambassador of Kwan! If the issue is more involved &/or the person is already showing signs of being irritable, post a reply that instructs them to look for a private message where you will reach out to them. If they do not accept private messages, post that publicly so that they (and everyone else) knows that you tried to reach out to them. Be sure to include a way for them to contact you, either by phone or email. Give them a specific person that they can contact, not a generic email address or phone number where they will have to explain everything from the beginning again. That will only make them more upset. Realized that sometimes, there is no solution or answer that can be given. At least, not under the current circumstances. After all, sometimes the customer is wrong, despite the cliché. In this case, be diplomatic and apologize for their inconvenience and see if there is anything at all that you can do to help them. You may be able to direct them to a different option than what they originally tried. What you don’t want to do is antagonize your customers. A few years back, Nestle had an issue with their source of palm oil, used to make Kit Kat bars. It was an ethical issue related to potential de-forestation and people took to posting on their Facebook page. The company took an aggressive stance and in my opinion, made the situation worse. Some of the replies that they made to customers were highly inflammatory. It certainly cost them some customers. In my role as social media administrator where I work, we are lucky that almost every complaint that comes to us via our Facebook page comes through as a direct message rather than as a posting to the page where others can see it. I attribute that to the fact that my employer has an excellent reputation for helping its customers, so people are not trying to embarrass us in public. By taking care of your customers that do have complaints, you will increase their loyalty to you and get bonus points for everyone else that saw how you took care of your customer. That’s a WIN-WIN! ← When Will You Become “Uberized”?